For sheer pageantry and spectacle, few motion pictures can claim to equal the splendor of Cecil B. DeMille's 1956 remake of his epic The Ten Commandment. Filmed in Egypt and the Sinai with one of the biggest sets ever constructed, this version tells the story of the life of Moses, once favored in the Pharaoh's household, who turned his back on a privileged life to lead his people to freedom. Digitally restored to the original VistaVision splendor, with a new Dolby Digital track made from the original sound elements. Awards: Won for Best Special Effects. Nominated for Best Picture; Best Cinematography; Best Art Direction-Set Decoration; Best Costume Design; Best Film Editing; Best Recording. 1957. DVD: 2-Disc set; widescreen 1.78:1/16x9; audio English Dolby Digital 5.1, English Dolby Surround 2.0, French Monaural; subtitles none; closed-captioned; single sided - double layered; 48 chapters; rated G; 220 min. ; $34.99; street date 3/30/99. Admittedly, these kinds of hits are rarities, so I doubt this evidence will do much to change the minds of multiplex managers. There aren’t enough three-hour-plus movies to make any real generalizations about their success, and most of the flicks on this list are older “event” programs; Titanic was the only epic since the Sixties to reach the chart. Nonetheless, it does seem somewhat surprising to note how wrong the conventional wisdom can be. Of those 11 films I mentioned, I’d seen nine of them prior to today. 1965’s Doctor Zhivago remains on my list, but it’ll receive attention in another three months or so when it bows on DVD. To catch up on the all-time hits I’d missed, I needed to go for one of the biggest of the big: 1956’s The Ten Commandments. This Biblical epic is one of those flicks that you feel like you’ve seen even if you haven’t. Charlton Heston’s performance as Moses long ago became a cultural touchstone; for the last 45 years, it’s been nearly impossible to envision the character any way other than as Heston. However, Prince emphasized some aspects of the tale that received little attention during Commandments. We see much more of the interactions between Rameses and Moses, and they’re cast in a totally different light. I couldn’t claim to know which is more accurate, but I thought the closer relationship that goes bad seen in Prince seems to be more resonant and rich. That version shows the pain and indecision felt by both parties, whereas Commandments is much more “old school”; we feel nothing but good from Moses and nothing but bad from Rameses, who is set up as an arrogant bully from the very start. On one hand, I give The Ten Commandments credit for its attempts to stretch the effects capabilities of the era. However, it used different visual elements in an odd and unconvincing manner that did little other than take me out of the story. Ultimately, much of The Ten Commandments has not held up well over the last 45 years. Why it pays to read credits on IMDB: according to that site, a lot of semi-notable people played bit parts in The Ten Commandments. Among the little folks were Mike “Mannix” Connors - who actually went by the first name “Touch” in those days! - plus trumpeter Herb Alpert - as a drummer, of all things. In addition, I found listings for Richard Farnsworth, Robert Vaughn, and Carl Switzer. The latter actor was best known as “Alfalfa”, since he played that character in the Our Gang comedies. As such, I felt as though most of my concerns about Commandments’ image really dealt with its aged effects. Though the film exhibited fine sharpness during many scenes, quite a few others came across as soft and hazy. Some of these occurred during effects-free moments, but the majority of the fuzzy shots happened when the picture featured more than one element. At times those scenes could become rather nasty to watch; the effects have not aged especially well. Nonetheless, I found most of Commandments to appear rather crisp and detailed. The image also lacked moiré effects and jagged edges, and I witnessed no signs of edge enhancement. One might expect a film from 1956 to display some print flaws, and one would be correct. However, I thought Commandments provided a relatively clean presentation. Occasional examples of speckles, grit, streaks, blotches and scratches appeared throughout the film, but these were never overwhelming. I should note that many of these occurred due to the complex visual elements I mentioned; effects-heavy or rear projection scenes definitely displayed the most significant defects. Black levels also looked rather deep and dense, and shadow detail appeared quite natural. Low-light scenes provided appropriately dark but not excessively thick images; for example, the sequence in which Moses met his real mother showed some fairly fine delineation. Ultimately, The Ten Commandments presented a satisfying picture for its age, though the flaws inherent in its visual techniques rendered much of it more problematic than I’d like. Much less exciting were the DVD’s supplements. Despite the film’s high profile, the package included almost no extras. On DVD Two, we got three trailers, all from different eras. Most interesting was the original 1956 ad. At 10 minutes, this was probably the longest trailer I ever witnessed, and it was one of the oddest as well. Much of the clip showed DeMille; first he expanded upon the introduction that starts Commandments, and he also talked about the flick as we saw shots from it. The other two trailers were more pedestrian. One came from a 1966 reissue, and at 60 seconds in length, it offered much less information. Oddly, the trailer ended with an indication that the MPAA gave Commandments a “G” rating. This seemed strange because that system didn’t start until 1968, which made me wonder if the ad actually came from a later re-release of the film. Lastly, we get a trailer from the 1989 reissue. This 100-second snippet mainly touted the wonders of big-screen viewings, and it also promoted the newly-remastered six-track audio. 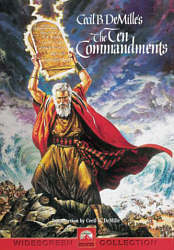 After 45 years, The Ten Commandments remains the best-known cinematic representation of Moses. However, I don’t think it’s the best, and the film hasn’t held up terribly well over the years. From hammy acting to cheesy sets to silly dialogue, Commandments suffers from the overblown pomposity that commonly affected epics. However, I must acknowledge that the movie receives a good treatment on DVD. The disc offers very solid picture and sound, though it almost totally skimps on extras, especially since the package lists for a relatively-high $34.98. Fans of the movie should be very pleased with this DVD, but if you’re new to it and just want an interesting Biblical effort, I’d recommend The Prince Of Egypt instead; that animated flick provides a much more compelling and moving look at the life of Moses.